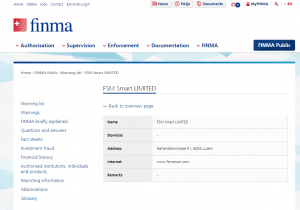 Beware FSMSmart is a Non-Regulated broker. It is NOT SAFE to trade. Is FSMSmart a scam or legit broker? No, it is not safe to trade with FSMSmart. Olymp Trade is own by FSM Smart Limited. The contact address of the FSM Smart Limited is in Switzerland, according to the website. Although, the company is actually registered on the Marshall Islands, the popular offshore destination for forex brokers. Marshall Islands is notorious for its practically absent requirements and regulations. Due to the setup cost is low and it does not regulate forex trading. Therefore, it became an offshore zone for shady forex brokers such as MegaTradeFX, ProFxPremium and more. 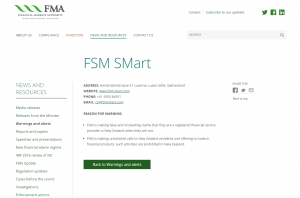 Moreover, FSMSmart has beenblacklisted by Swiss FINMA and New Zealand’s FMA, which stated that FSM is making false and misleading claims that they are a registered financial service provider in New Zealand when they are not and also FSM is making unsolicited calls to New Zealand residents and offering to trade in financial products, such activities are prohibited in New Zealand. We have heard brokers Marshall Islans deny traders withdrawing fund. We have feedbacks from traders that they cannot withdraw money. You can read the feedback here. We advise all investors and traders avoid FSMSmart and other brokers from Marshall Islands. Traders should trade with well-regulated brokers such as UK brokers or brokers in Australia and reliable brokers such as etoro and plus500.